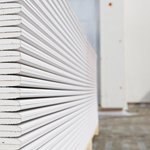 The increasingly high insulation results in a significantly reduced transmission heat loss in winter but also in overheated living and working areas in summer. Free cooling eases this effect in cool nights, but this does not work during daytime with hot outside temperatures. 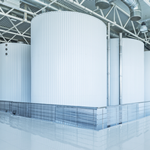 There are only two working options, either active air conditioning or increasing the storage capacity of the building by means of latent heat storage materials for example. Modern air conditioning systems, e.g. those complying with VDI 3804, primarily provide for water-based systems to cooling down modern buildings aside from air-based systems. Chilled ceilings are a superb option because they allow an optimum room climate from a thermal point of view and have energetically favourable flow temperatures at the same time. In addition to this, such systems work almost soundlessly and have a positive effect on the acoustics of the room. 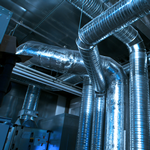 It makes sense to upgrade chilled ceiling systems to systems that store energy by means of PCM. Such PCM chilled ceilings can passively absorb heat without technical support and cool without the need of a refrigerating machine. The heat that is stored in the PCM chilled ceiling can either be regeneratively emitted to the environment (night cool down) at a later stage or actively discharged by a refrigerating machine at a clearly lower power consumption. This does also allow for shifting the peak demand for power. 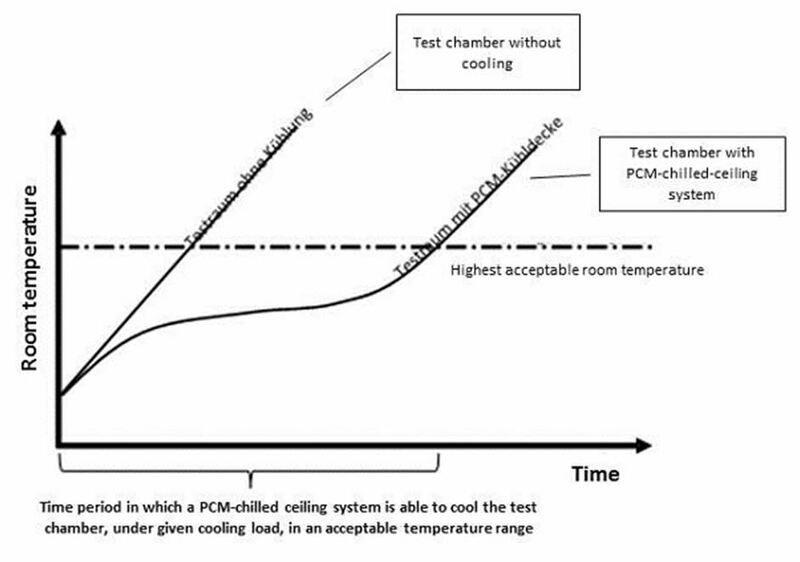 It is obvious that the air temperature in a room will proceed significantly cooler and thus more comfortable for a long time when using PCM chilled ceiling systems. An important characteristic of the PCM chilled ceiling system is its ability to always regenerate the PCM storage. 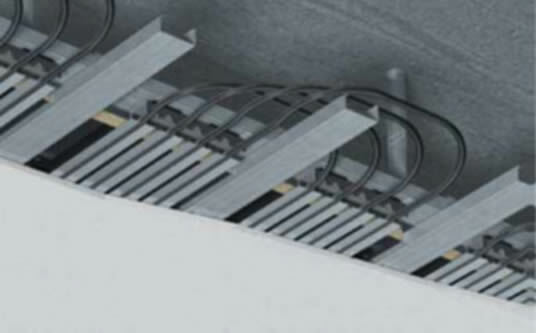 The chilled ceiling allows for this by cooling the PCM storage with the embedded water bearing pipes. The required cool water is either recovered regeneratively from the cool ambient air during night time or produced mechanically. This provides for an availability of the chilled ceiling at all times. 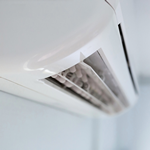 If the mechanical cooling is turned on, PCM chilled ceilings work like common chilled ceilings.